As a homeowner, your home can reflect a lot about your personality. If visitors see that your home is poorly-designed or doesn’t have any style at all, they might give the same impression to your persona. This can even imply that you don’t consider your home as an important investment. When you’re a homeowner, you should pour in time and effort to ensure that everything in your home is in perfect working condition which includes the amenities and everything else in the property. Aside from these, you should also make sure that your home has a beautiful interior. How your home looks on the inside can make or break the mood your home can give to you, your family and visitors. If you want to bring life to your home, consider using paintings from photos. It provides an instant color palette: Having all of your rooms painted in the same color can be boring. Sure, it might look pleasing to the eyes, but it’s just that – pleasing to the eyes. It doesn’t give the rooms any excitement or fun. When you use paintings from photos, you can break the monotony. This piece of art can become the pop of color your room needs. And because you can customize how the painting will look, you can have the option of having it in black and white or in full color. It brings a sense of texture: Paintings from photos are different because you can have the liberty to personalize it. Unlike traditional photos, paintings from photos will not fall flat once hung on the wall especially if you adjusted its texture. When the painting in your room has texture, it can affect the visual weight of your home’s interiors while setting the tone or mood of the room. Carefully pick the texture you would want these paintings to have so you can achieve what you want your room to look like. It makes the room appear finished: Looking at a blank wall can create the feeling of emptiness or something that’s rough around the edges. As a homeowner, you should strive to make your home to become the complete opposite – it should be cozy, complete and clean. Having a painting on your wall can help you achieve that goal. Assess what style your rooms have and have the paintings complement those designs. Adding a piece of painting can do wonders for your home’s interior aesthetics! It brings a touch of uniqueness to your home: It’s common to see paintings or photos displayed in every room of a home. Some homeowners even consider these pieces as their home’s highlight, especially if they invested in expensive paintings from well-known artists. 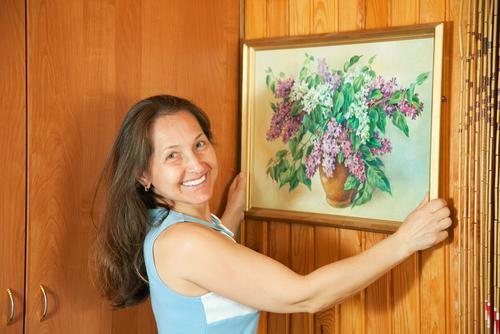 If you want to be a unique homeowner, use paintings from photos. You’ll be able to showcase your life’s significant milestones such as your wedding day or child’s first birthday, in a medium which is apt for your style. It places art front and center: Family portraits taken at studios or outdoor locations are beautiful. It can become a remembrance to family members who passed away or showcase another addition to the family. These portraits already look good as is but when these are turned into paintings, it can still get better. Paintings from photos are the perfect fusion of memories and art. You’ll remember everything that happened when the photo was taken and have it recreated in another artist’s painting style. If you consider yourself as a connoisseur, this is another reason to love paintings from photos even more! It creates a focal point: One of the basic rules when it comes to interior design is having a focal point in every room. This means that one design element should be seen once a person enters the room. A focal point is important because it draws the eye into the space and gives that person a sense of what to expect. Let paintings from photos be your home’s focal point. If you want to let your visitors see how beautiful your family is, hang your family portrait on top of your fireplace. If you want to spice up traditional rooms in your home (like your dining area or living area), hang your children’s photos. While you’re at it, keep in mind that size matters. If you put a painting which is too small, it can get dwarfed by other furniture in the home and won’t be as visible. On the other hand, if you use a painting that’s too big, it can overpower everything else in the room. It’s vital that you take measurements of your available wall space first. Your home doesn’t come cheap; most often than not, you bought this with an expensive price which required you to sacrifice several things along the way. You might even have saved for this home for years just so you can provide one for your family. And now that you’re finally a homeowner, you should work in order to make this investment look good even in the years to come. You shouldn’t be complacent just because it looks beautiful today. In fact, you should think out of the box so your home can still be aesthetically pleasing in the long run. If you don’t know where and how to start, consider paintings from photos. These might be the only solution you’ll ever need to bring life to your home!